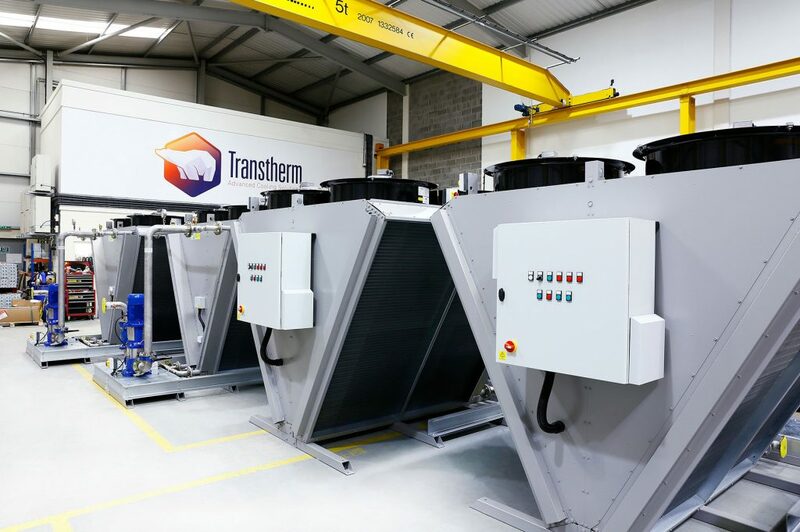 Transtherm offer a one-stop solution for its air blast cooler and pump set technology. 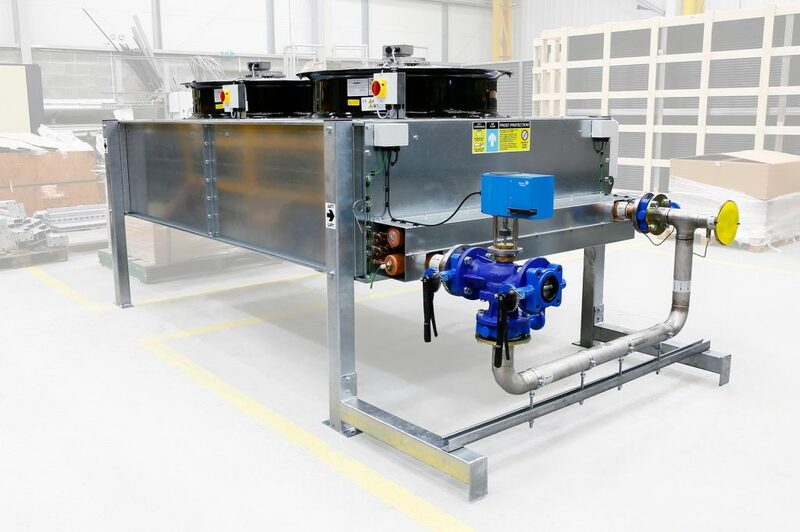 Combining both technologies from Transtherm, the Packaged Cooler & Pump Set Solution requires minimal system design, installation and commissioning time. 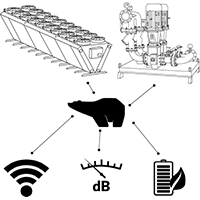 As a result of incorporating equipment that is specifically designed to work together, the unit offers greater reliability and efficiency. 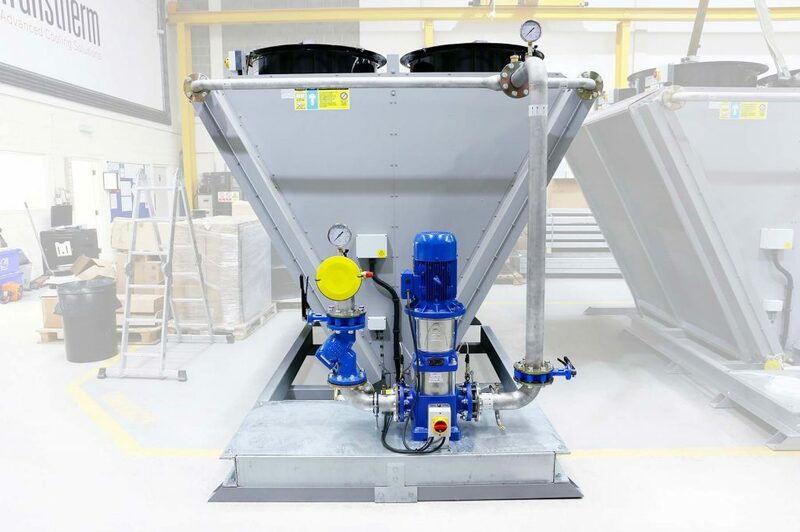 Transtherm design and manufacture packaged Air Blast Coolers and Pump Sets that are designed to work perfectly together. The total input power of both cooler and pump set is considered so best overall efficiencies are achieved. 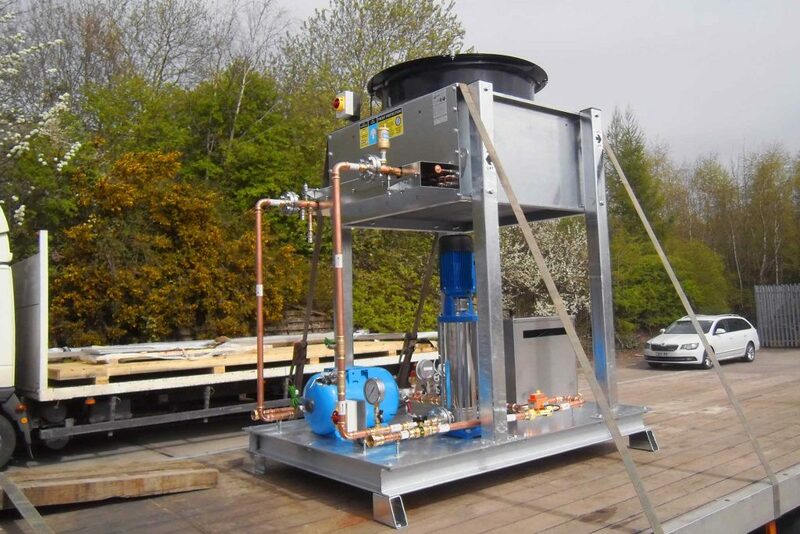 All cooler and pump controls are supplied in a single panel requiring only a single 3ph power feed, both items are supplied on common mounting steels so there is only a single lift and the cooler to pump set interconnecting pipe work is already taken care of. 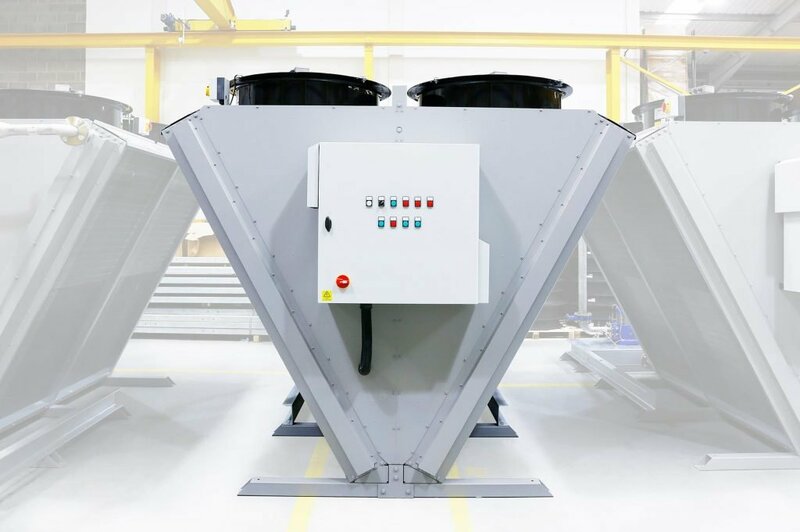 The majority of Transtherm Air Blast Coolers are supplied with energy saving EC and AC variable speed fans where the cube rule states that the power consumption is relative to the cube of the fan speed (e.g. where fan speed = 50% the input power = 12.5%). 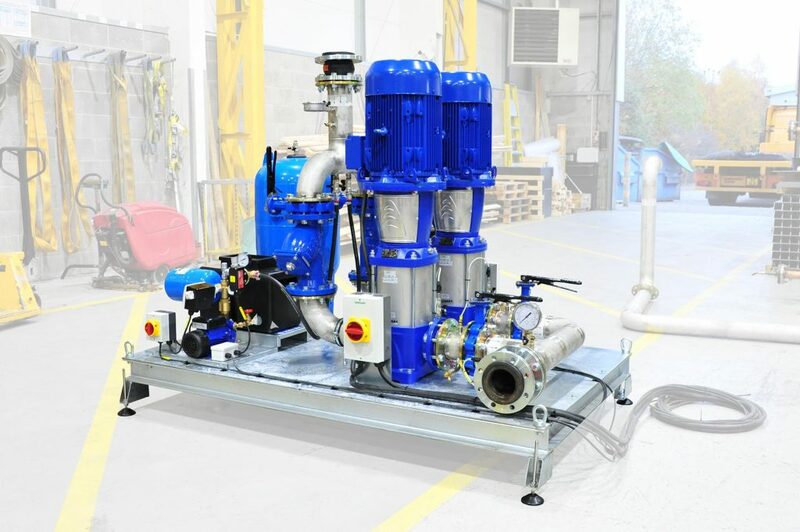 Variable speed inverter driven pumps are also offered – this means that the traditional inefficient method of balancing system pressures by closing valves with the pump running flat out is a thing of the past. 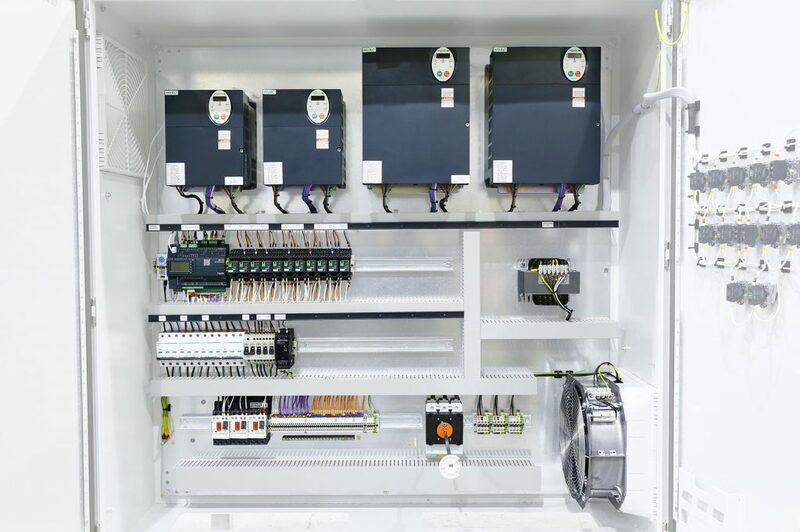 Transtherm uses pump inverters and PLC controls to dial in the required pressure and allow the pump motor to back off and reduce energy consumption. 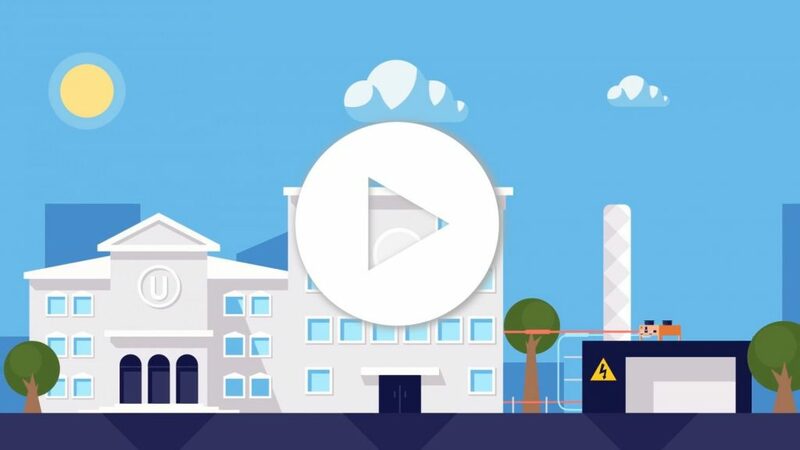 Where redundancy is of paramount importance at sites such as hospitals and data centres etc. 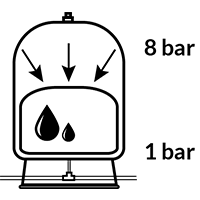 Transtherm offer designs with standby pumps that automatically engage should a fault be detected with the primary pump. 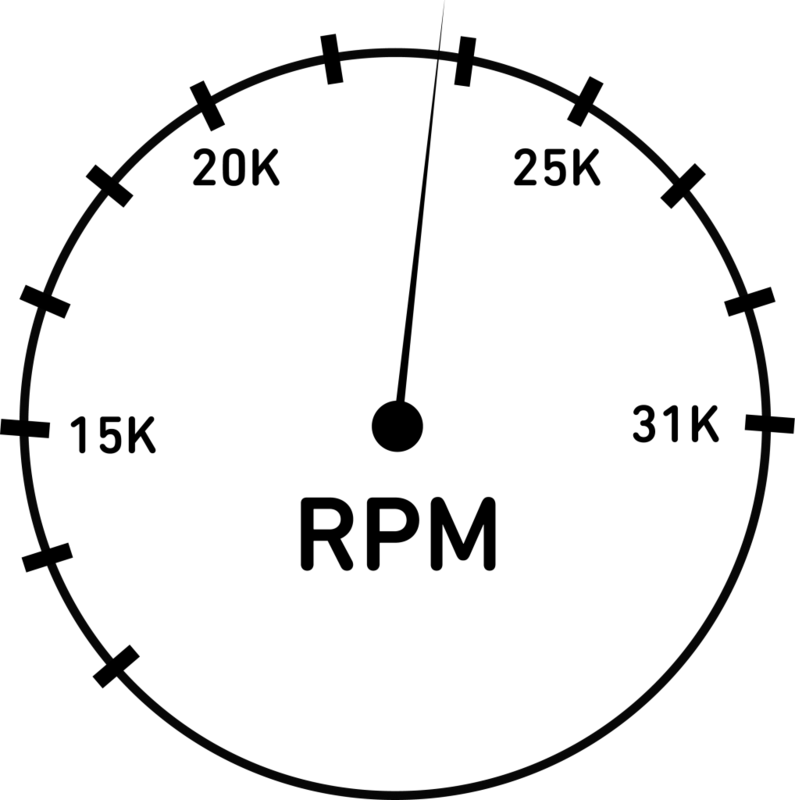 There is lead pump rotation as standard to give even motor wear. 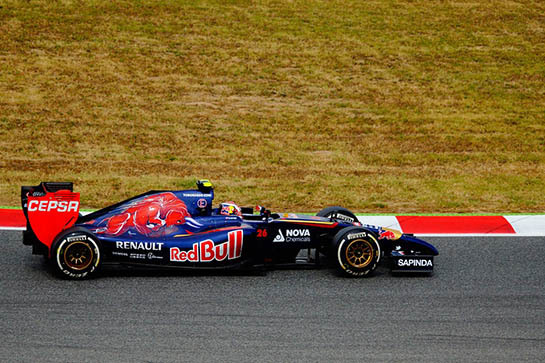 Transtherm use the most advanced equipment selection and 2D/3D modeling software. 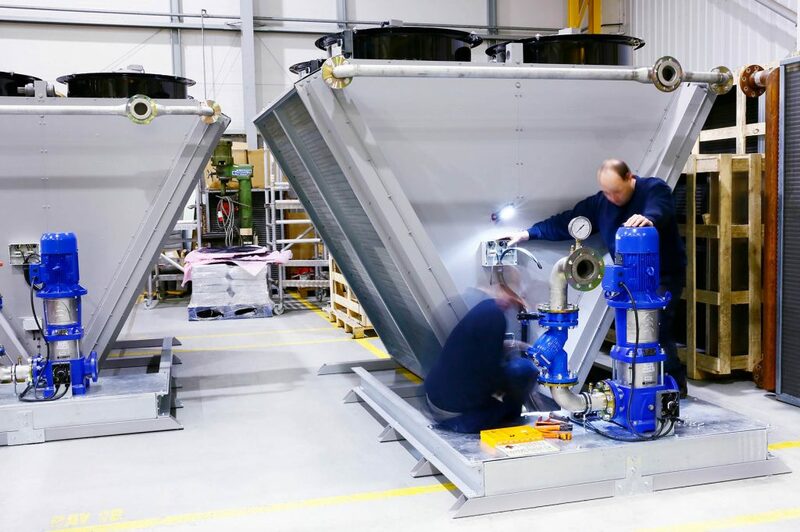 This ensures our dedicated team provides an unmatched combination of capability and flexibility in the design of your cooling and pump set system. 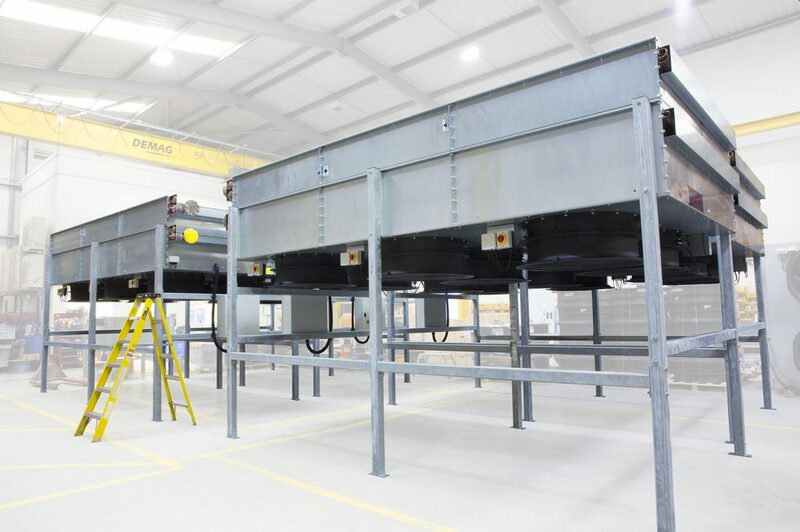 Bespoke footprint, acoustic and construction material requirements are all catered for. 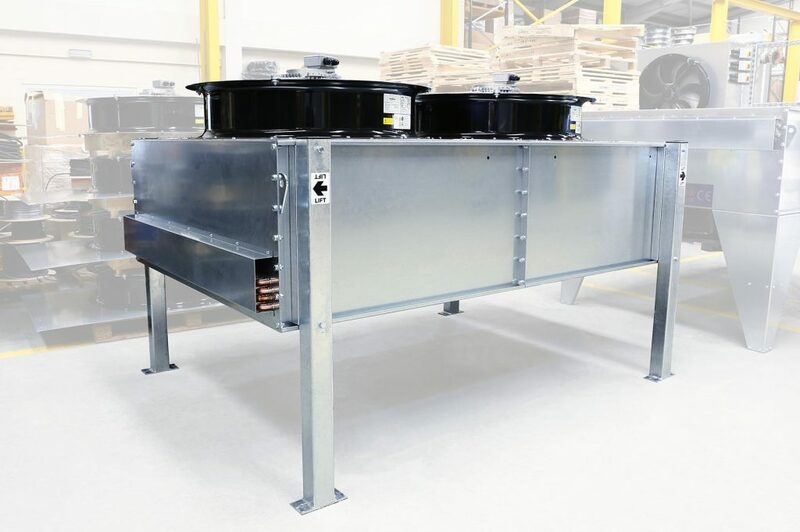 Who are Using Transtherm's Packaged Cooler and Pump Sets? This pump set is used on an electromagnetic coil cooling system. 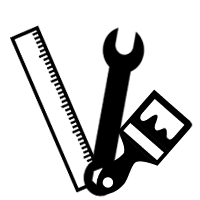 Special requirements included a flow meter and flow indicator. 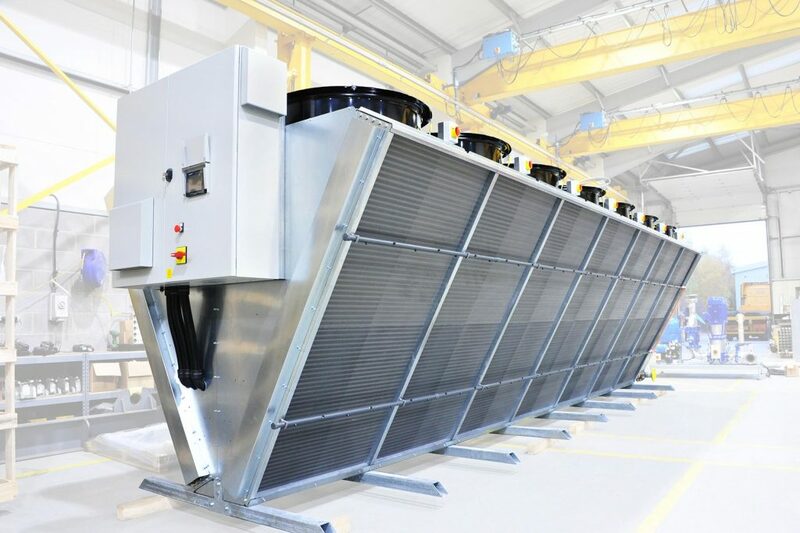 3 x Transtherm Hydrodynamic coolers, combining Air Blast Cooler and Pump Set technologies, were used to cool CRAC units in summer and for Free Cooling in the cooler months. 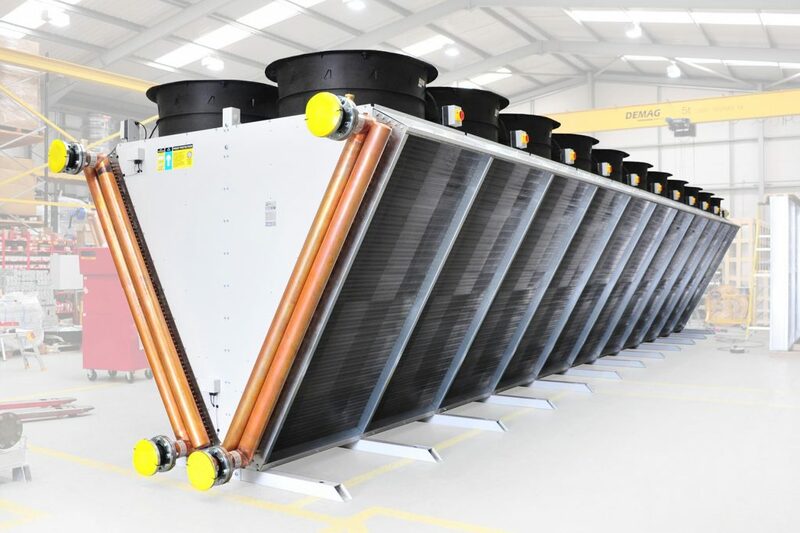 Variable speed fans and pumps and a bespoke PLC program were used to further enhance the energy efficiency of this data centre cooling system. 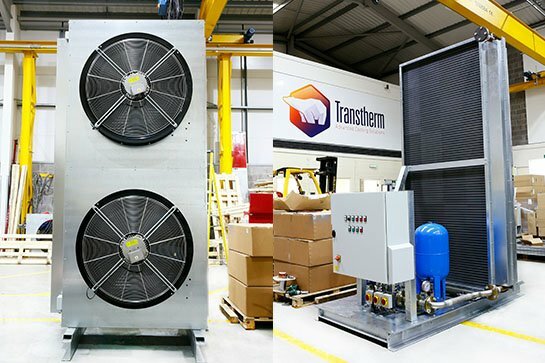 Transtherm provided bespoke designs for these two unique vertical packaged coolers and pump sets in order to give a perfect fit into an old doorframe to optimise the space usage for a data centre in London.